RubberFlex Acoustic Underlayment is an acoustical underlayment that's the preferred choice for high-rises, office buildings, hotels, multifamily homes or simply for the personal comfort of the homeowner. Its state-of-the-art design significantly reduces ambient noise ― sourced from within the room or from an adjoining or nearby room ― meeting national building code sound reduction requirements. How does it work? RubberFlex Acoustic Underlayment is fabricated from a network of thousands of tiny rubber granules. The resulting product effectively interrupts and absorbs sound waves as they travel, contributing to an acoustically healthier indoor environment. And RubberFlex Acoustic Underlayment offers superior underfoot comfort for standing, walking or exercising. Langhorn Flooring offers polyurethane adhesives ideal for permanent bonding to concrete or wooden subfloors. 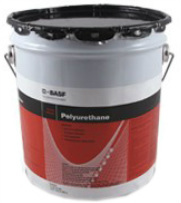 All poly adhesive products are VOC compliant with extremely low odor and contribute to LEED credits. Adhesive is available in either two or five gallon sizes. Installation kits are also available for adhesive application. Langhorn Flooring Concepts Inc. is proud to confirm that our manufacturing facility has been accredited with Floor Score Certification to qualify for use in buildings with recycled building materials requirements. RubberFlex Acoustic Underlayment can help specifiers by potentially contributing to LEED points. 36" cut at 36.5" +/- 0.24"
48" cut at 48.5" +/- 0.24"
60" cut at 60" +/- 0.24"